A hallmark of a youthful appearance is a well-defined jawline with a clear demarcation between the face and neck. No matter how youthful you look, a sagging neck is one of the first places to show your real age. Read more about Neck Lifts in Beverly Hills. The aging neck is the result of changes to the skin which sags along the jaw line, jowls that result from too much fat and skin under the jaw, underlying muscles that are stretched and loose, accumulated excess fat under the chin, and crepey neck skin. Sun damage, photo-aging, heredity, gravity and the normal aging process create these changes over time. There are fewer oil glands in neck skin, which causes dryness and hastens aging. Additionally, the neck is often unprotected from the sun and rarely moisturized. When the neck muscles deteriorate, vertical cords become more noticeable. When combined with all the neck twisting and turning during life, and of course our use of smart phones, which keeps our necks chronically bent, the result is a less than perfect lined and wrinkled “turkey wattle”. 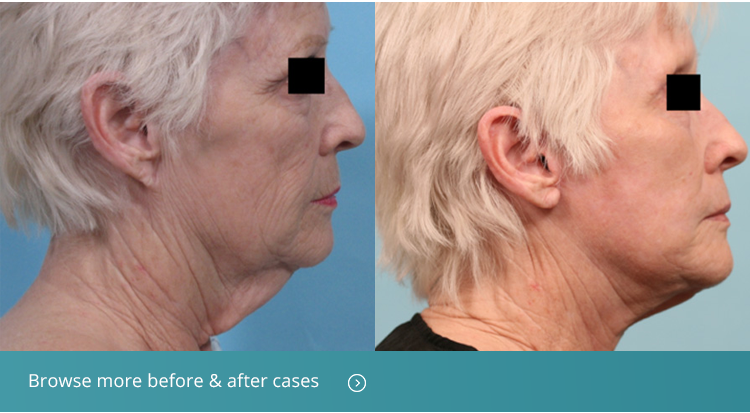 A neck lift is a surgical procedure that improves and enhances the appearance of the aging neck. A neck lift removes excess skin and fat, tightens the skin and underlying muscles, and restores jawline contours for a youthful neck profile. While less invasive procedures can target these problems to some degree, when there is a significant amount of extra loose skin, only a surgical procedure can restore contour most effectively and naturally. During your consultation, your facial cosmetic surgeon in Beverly Hills will determine if you are a good candidate for a neck lift and thoroughly review the procedure, pre-operative requirements, and post-operative expectations. Get to know our team of top cosmetic surgeons in Beverly Hills. Your facial cosmetic surgeon will discuss with you the degree of change you desire. The scope of surgery will depend on your needs and goals. Surgical incisions vary depending on which neck lift procedure is chosen, but are placed to be as inconspicuous as possible. A traditional neck lift may involve an incision in the hairline that goes down and around the ear and ends in the hair. These lines hide in normal creases and become almost completely imperceptible over time. The skin is repositioned, and the underlying muscles are tightened. Another incision under the chin may be recommended to remove excess fat in the region. We typically perform neck lift procedures under local tumescent anesthesia or twilight anesthesia in our Beverly Hills clinic, both of which are safer than general anesthesia. Tumescent anesthesia also helps minimize bleeding, which eliminates the need for hospital stays and uncomfortable neck drains. The risks of this procedure are the same as with other surgical procedures and may include anesthesia risks, bleeding, temporary or permanent hair loss due to incisions, infection, swelling, changes in skin sensation, pain, poor wound healing and rarely nerve injury. Your cosmetic surgeon will fully discuss these issues and address all your questions at your consultation. The goal of your consultation is to identify your surgical goals, review your medical conditions and medications, and evaluate your health. Your cosmetic surgeon will examine and evaluate your neck, jaw anatomy and skin, and discuss multiple rejuvenation options. Often laser resurfacing is recommended with surgical procedures, so that your new, younger neck contour matches the quality and age of your skin. In addition, sometimes we recommend a concomitant facelift, so that the face and neck contours match. During your neck lift consultation, we will measure your face and take photos, and recommend the best procedure or procedures for your goals. The best candidates for a neck lift are healthy, do not smoke and have a positive outlook and realistic expectations. It can take a few weeks to a month for swelling to fully resolve. When bruising, which is typically minimal and swelling diminish, visible improvements will be revealed. Results will improve over time as the overlying skin tightens, and complete results are often seen within six months. When you seek a neck lift from a Moy, Fincher, Chipps Facial Plastics & Dermatology cosmetic surgeon in Beverly Hills, you will find dramatic rejuvenation that looks completely natural, and life-enhancing with minimal incisions and scaring. An improved neck appearance will contribute to a youthful look and improved confidence.